USDJPY is chiefly under the influence of American and European stocks. 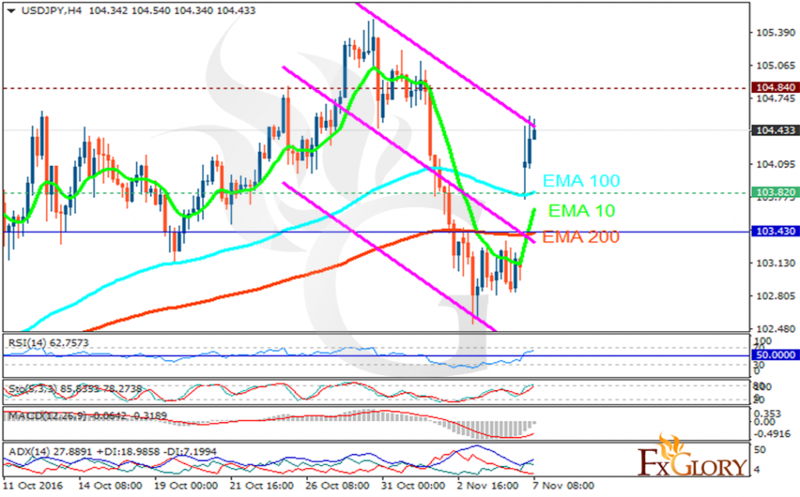 The support rests at 103.820 with resistance at 104.840 which both lines are above the weekly pivot point at 103.430. The EMA of 10 is moving with bullish bias and it has crossed the EMA of 200 and it is now close to the EMA of 100. The RSI is moving in oversold area, the Stochastic is showing upward momentum and the MACD indicator is in negative territory. The ADX is showing stronger buy opportunity than sell. Soon USDJPY will start its correction pattern heading downwards.